1. It is not enough to just stop a behavior. Negative behaviors must be replaced with positive ones. For example, instead of smoking, knit when you feel the urge to smoke. If you have struggled with substance abuse, instead of attending parties where alcohol is being served, meet friends at a coffee shop or, even better, attend an AA/Smart Recovery Meeting. 2. Target one goal at a time. You will feel bombarded if you try to focus on too many. 3. Take it one day at a time. Do not overwhelm yourself thinking too far in the future or reminding yourself of mistakes from the past. Focus on the present and you will have a better chance to succeed. 4. The desire to go back to the old behavior may seem tempting, but remember that “this too shall pass.” Just get past the moment. Have a supportive person, such as a family member, friend, counselor, or some type of inspirational motivation, ready to help you overcome that feeling of giving up. 5. Be purposeful and focus on your goal whenever possible. It may seem small, but change your passwords to focus on that goal. Or change your screensaver to remind you of it. 6. Don’t listen to the tormenting little voice in your head that says, “you can’t reach your goal.” Always consider the opposite of what it says. If you keep hearing “you aren’t good enough,” flip that inner conversation to remind yourself that you are good enough. Don’t believe lies. 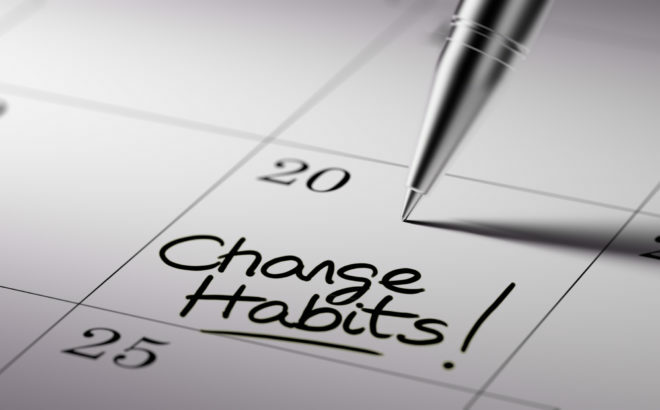 The bottom line to making and breaking habits is to be kind and patient with yourself when working on change—and show that same consideration to others when they are working on their new habits.